But it may be the single most important thing you do as a manager. Because the alternative - an unengaged staff - doesn't just cost you and your company time and money - it leads to a workplace no one wants to work for. Who wants that? We aren't psychics or psychologists. We need a framework, tools and encouragement to create an engaged team of empowered and accountable employees who don't come to work just to punch a clock for a paycheck. How to motivate employees and provide incentives (other than money)? All my employees are different, how do I figure out what motivates each person? How do I deliver incentives and rewards without breeding entitlement? How to tell if someone is self motivated before I hire them? How do we create an environment that fosters productivity and engagement? How to set expectations and get employees to embrace accountability? If you want help on how to put that ideal into practice the ResourcefulManager way, and get practical guidance then we encourage you to get the assistance you want in a single afternoon from the 82-page Motivating Employees Blueprint and bonuses. ResourcefulManager's "Practical Guide For Motivating Employees" Blueprint comes with an unconditional, 100% money back guarantee. 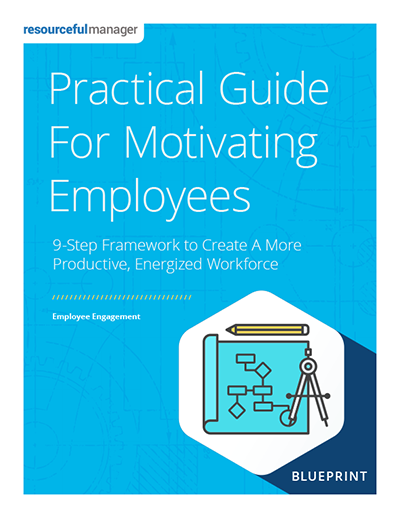 If you decide the "Practical Guide For Motivating Employees" Blueprint doesn't deliver value or simply isn't your cup of tea, just email us at contact@resourcefulmanager.com within 90 days, and we'll process your complete, no-hassle refund in 1 business day or less.